Some of the best benefits that this town has to offer are those causes created by passionate people doing what they love--hard. The folks at NOW-ID (formerly Now International/ Interdisciplinary Dance Co.) happen to be doing just that. NOW-ID, for those in the lurch, is a "contemporary dance and design company". Based in the good ol' SL of C, NOW is driven by a "passionate belief in the power of art to engage and move people and foster social change"--and to that, we're prepared to start a slow-clap any day. The group creates "forward-thinking, innovative, and encompassing work for both artists and audience," and we've touted a fabulous few of their past performance- and experience-based events (here and here). 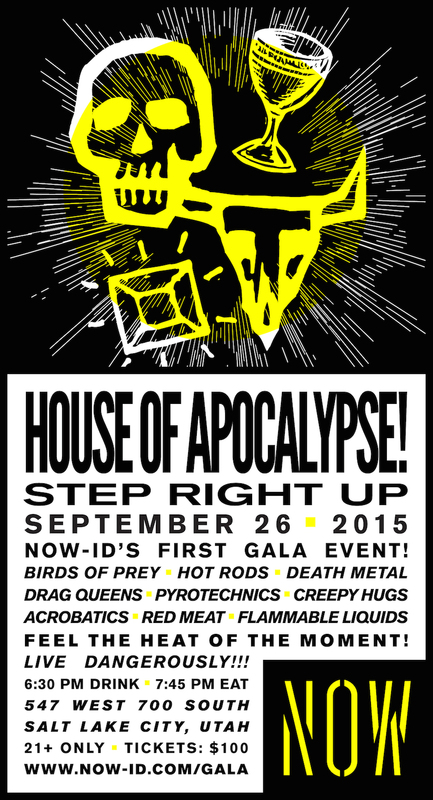 This year, the group is throwing together their first ever inaugural gala, and with a theme like House of Apocalypse, we're COLLECTIVELY intrigued as can be. The roster reads like a post-apocalyptic proclamation: Hot Rods! Death Metal! Birds of Prey! Drag Queens! Pyrotechnics! Flammable Liquids! And the details are juicier, still: SLC's own Bad Kids Collective will be performing as the Four Horsewomen of the Apocalypse; an open bar (!) courtesy of Vida Tequila, Beehive Gin, Squatters, Sugarhouse Vodka, and Bar-X; performances from SLC's devilishly-talented instru-metal duo Cornered By Zombies, a meal crafted by Robert Angelilli, an end-of-days-street-preacher-style MC (the lovely Robert Scott Smith), and a slew of other Armageddon-apropos events (including spins from DJ Jesse Walker, an auction, acrobatics, and a media show from alchemist Chris Howard). Think: Mad Max minus the eminent danger. Think: Waterworld minus the water. NOW-ID "selects unique venues that inform the work and enrich the audience, user, and community experience of our built spaces and cultural assets", and this year's gala will be no exception. The affair is set to take place in the (very fitting) Addictive Behavior Motor Works space in the Granary District. Those with a piqued curiosity would do well to snap up tickets sooner than later (there are a limited number), show up in your finest apocalyptic attire (anything from tatters to tuxes), and prepare to have every last one of your senses delighted half to death.